The purpose of this page is to give you some pointers with respect to what you should expect on the day of your exam. The location of your exam will depend on whether you registered to be proctored remotely by an online agent/proctor, or MEF Accredited Training Provider (MEF-ATP). Scheduling your exam for either option is your responsibility. Please contact ProctorU for scheduling an online proctored exam, or a MEF-ATP for a facilities-based proctored exam. On average, each exam is 1 3/4 hours long and is multiple choice. A single sheet of blank paper and pen or pencil may be used. The paper used to during the exam must be destroyed once the exam is completed. We recommend exam registration 72 hours prior to an exam to minimize registration errors, missed instructions etc. Registering 72 hours prior to an exam is also a requirement for the free online proctoring services we make available for those who need it. Exam re-takes may be registered immediately. If online proctor is required, the 72 hour advance setup is required. For all exams at held at any location, candidates are required to store electronic devices (cell/mobile/smart phones, tablets, pagers or other electronic devices) outside the testing area or in a location monitored by the exam proctor. We recommend arriving at least 30 minutes before your exam is scheduled to begin. This is to provide ample time to check you in and check your computer. Even if you arrive early, if there is not enough time to check you in and check your computer you may not have enough time to take the exam. Prior to your exam, an exam proctor will assist in reviewing your computer for minimum compatibility and security requirements, and monitor you during your exam. Your system must adhere to the following minimum requirements. There is always the potential for a computer or network problem to occur, however, we attempt to minimize the issues by requiring the following minimal compatibility requirements. Proctors are responsible to check minimum system requirements. If a system can be adjusted to achieve the requirements, a computer proven to meet the minimum requirements must be used instead. Clear your cache/history, or load a new browser such as Firefox. Browser caching issues can cause problems with applications. NO screen capturing/recording and utilities in system tray, system processes or browser toolbar. The exam room should provide a comfortable sitting arrangement with a minimum 3 x 3 meter space with a clean desk void of any papers, technical diagrams on walls, sticky notes on computer etc. The exam space must be void of any papers, technical diagrams on walls, sticky notes on computer etc. Any person creating distractions during the examination should exit the exam room. To avoid distractions, exam participants should be seated in a position with their backs back towards each other participant. There are different methods of proctoring. During exam registration you are given several choices of proctors. The most common are to be proctored by an online proctor agent and MEF-Accredited Training Provider. At the day and time of your proctor session, you will login to the online proctor account. During the proctor session, your computer is checked and instructions for the exam are reviewed. 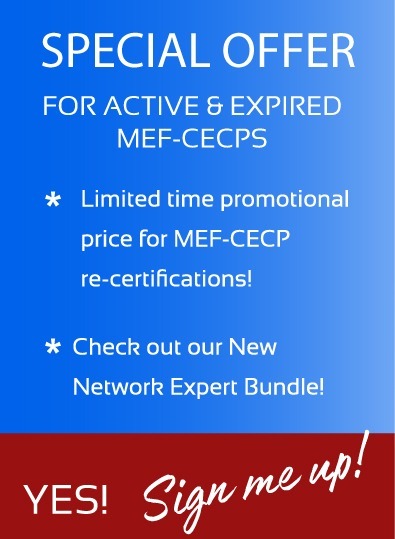 If/when you selected to take the exam through an MEF Accredited Training Provider (MEF-ATP), you must contact that training provider to arrange the test location and scheduling and specific instructions. Click here for a list of training providers. At the time the exam is ready to begin, the proctor will provide you with your login identity and password. At no time after you complete the exam can this login information be used. Any information provided to you prior to the exam, such as paper with login ID and password, must be destroyed. As computers are checked and monitored throughout the exam, should any capturing or recording take place, after completing your exam, your any current or future certification attempts will not be allowed. Problems that may occur during an exam. At the completion of your exam, results are calculate and automatically displayed in your exam dashboard within approximately 10 minutes. The same results will be sent to you by email. If you pass the certification exam, the results will indicate "Passed", your certificate will be created an placed into your certification profile and you will be listed among those who have passed the certification exam. If the results indicated you "Failed", you may register for a re-take exam as soon as you wish. Please note that only 3 exams may be taken in a 6 month period. This "time out" is required for you to attain more training so that your next attempt is a success.